Our Studio Apartment accomodates 2 to 4 visitors. Available is a double bed, as well as a couch, which can simply and safely be concerted into a double bed. All our Two-Bed Rooms are equipped with a bathroom; including a shower, cable television, mini-bar and they all have access to free internet. All of our guests are served with a full and rich buffet style breakfast. »Penzion Livada« is a smaller, family owned and operated business with lots of wonderful tradition. It is situated off a main road, which leads into the town of »Vršič« in the immediate viscinity of the Bus Station. Only minutes, seperate us from the ski hills and center of town and this by foot, or car. The closest store is only a few steps away from the house. This was a very pleasant hotel. The rooms have self catering facilities and are quite spacious. There is a communal bar and a restaurant to dine in at night if you so wish. Breakfast is also available and there is a wide choice including: fruits, cereals, breads and eggs. The staff are very friendly and speak good English. We stayed for 9 days: it was great, very helpful atmosphere, nice staff, beautiful surroundings – close to the town centre and the main road. Food was excellent, we had tasty breakfasts and dinners, restaurant was with the view on high mountains. Everything we needed was available: books, maps and leaflets about the local area, free internet in room, Tv, all kitchen appliances, even microwave and coffee machine! Een net hotel met een verzorgd en uitgebreid ontbijt waarbij voor iider wat wils is. De gastvrouw is vriendelijk en behulpzaam. Het hotel ligt rustig aan de rand van het dorp maar toch ook op loopafstand tot het centrum en verscheidene winkels, cafés en restaurants. De omgeving is prachtig van natuur. 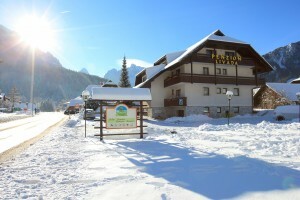 A well presented and attractive hotel located within easy walking distance of the beautiful setting of Kranjska Gora. Upon our family groups arrival we were warmly met by the staff who made us immediately feel welcome and settled. Helping us with our bags and serving welcome complementary drinks. Their attentiveness, professionalism and willingness to please lasted throughout our stay. The rooms were well decorated and maintained. The food was always delicious with plenty of choice. We were sad to leave as the owners were so friendly and helpful. I would highly recommend this hotel. The spring attracts nature enthusiasts to the Zgornjesavska valley. Breathtaking panoramic vistas and the rich natural and cultural heritage offer countless opportunities for family outings. Our magnificent mountains are a true paradise for both hikers and mountain climbers alike, while cyclists can try the more demanding mountain slopes or just relax taking an enjoyable ride along the well-kept trails. The largest and the highest alpine mountain group in Slovenia is a part of the largest European mountain range the Alps. Its name comes from the roman city Forum Iulii, which is today Cividale in Italy. One third of the Julian Alps is on Italian territory, bigger part in Slovenia covers Triglav National Park. The white fairytale of the Zgornjesavska valley offers the possibility of countless adventures. Skiers and snowboarders will find their challenge on the snow-covered slopes, while others can find their recreation on the well-kept cross-country tracks or by sledding on toboggan runs. Climbing a frozen waterfall, day and night snowshoeing, hikes with torches are an unforgettable experience. The white soul of Kranjska Gora is and always will be Alpine skiing. A special characteristic of the skiing offer of Kranjska Gora is the diversity of the slopes offering quality skiing to both beginners and experienced skiers alike. Snowboarders will also find a place for themselves on the ski slopes.